Each of Roscoe Mitchell's “Conversations for Orchestra” serves as a testament to the vitality, extensibility, and sheer wonder of the composer's flexible musical imagination. The project's story is one of a body of music ill-content to be voiced in but one way at but one time, and of a community of talents spanning several generations drawing from all over the globe. When the internationally renowned orchestral conductor Ilan Volkov invited him to the Tectonics Festival in Reykjavik, Iceland on April 14th and 15th, 2016, to perform at the Harpa Concert Hall, Mitchell was inspired to birth a series of compositions, drawing on transcriptions of improvisations from the albums “Conversations I” and “Conversations II” he recorded for Wide Hive Records in September of 2013 with pianist Craig Taborn and percussionist Kikanju Baku. Using these transcriptions to populate material serving as the basis for orchestral compositions, Roscoe has been able to articulate the relationships between composition and improvisation that undergird his creative praxis. Prior to the September 2013 recording sessions, Mitchell sent Craig Taborn and Kikanju Baku some selected improvisations from his solo album “Sustain and Run,” which documents his concerts as a solo performer in Sau Paulo, Brazil in August of that year, released by the Selo Sesc Recording Label. These recordings gave Taborn and Baku some insight into Mitchell's current interests and aspirations as an advanced practitioner of the art of spontaneous composition, serving as a set of archetypes from which they could decoct a collaborative, highly-nuanced improvisatory dialect. The result of these sessions was the aforementioned critically acclaimed duology consisting of “Conversations I” and “Conversations II,” released on Wide Hive Records. Propelled by a flash of inspiration and the humble acknowledgment that the trio had unearthed a host of musical particulae, begging to be reformulated in accordance with the principles of Roscoe Mitchell's craft-oriented methodology, the composer sought out some of the world's keenest young musical minds: budding experts in the fields of music theory, orchestration, and transcription. Under his employ, these transcriptionists provided Mitchell with documents notating each and every sonic event audible on select tracks from “Conversations” I and II. This afforded Mitchell the ability to decompose each piece into a body of ideas, gestures, phrases, and the like. Utilizing these elements as the raw stuff of musical assemblage, Mitchell was able to generate new ideas and/or extract thematic components which were discernible only as subtext in the original recordings, bringing them to the forefront by means of his meticulous techniques of variation and voicing, attentive to minutiae at the subatomic level whilst evocative of visions horizon-breaching in scope. He first sought out Paul Steinbeck, Assistant Professor of Music Theory at Washington University in St. Louis, Missouri, asking for his insight into the project and references to students and/or fellow professors who may be up to the formidable task of producing accurate, note-by-note transcriptions of the improvisations recorded by Mitchell, Taborn, and Baku. In December of 2015, Professor Steinbeck sent him the names of Stephen P. Harvey, a graduate student at Youngstown State University; Dr. Christopher Stover, working at the time as an Assistant Professor of music theory and composition at the New School College of Performing Arts (now working in the same capacity at Arizona State University); Shirantha Beddage, Director of Theory and Harmony at Humber College of Music in Toronto, Canada; and Marc Hannaford, a graduate student in music theory at Columbia University. Each recommendation proved to be well-merited, as all mentioned demonstrated virtuosic flair in their precise transcriptions of the highly-complicated music with which they were presented. Stephen P. Harvey transcribed “They Rode for Them,” “Wha-Wha,” “Who Dat” (this album’s final track), “Frenzy House” (track six) and “Distant Radio Transmission.” The original “They Rode for Them” is an improvised duet for bass saxophone and drum set which showcases Kikanju Baku's hyperlight, pyrotechnical mastery of the kit and Mitchell's decades of finely-honed technique on the bass saxophone, as can be heard on “Conversations II.” Baku's intricate interplay between the various components of his drum kit formed the basis of the arrangement for the orchestral work, “They Rode for Them Part Two.” Mitchell elided the bass saxophone's contribution to the piece, instantiating himself instead as an improviser playing the sopranino saxophone. A video of the piece being performed in Montreal can be found online. “They Rode for Them Part One” is the product of a differing interpretation of the same material, this time distilling the bass saxophone from the original recording and making it the foundation of the orchestration. Live performances of the piece have featured Sara Schoenbeck improvising on bassoon – a fitting analogue to Mitchell's full, sonorous bass horn. Dr. Christopher Stover, transcribed and orchestrated this album's second track, “I’ll See You Out There.” The piece's live world premiere will be at the de Young Museum in San Francisco, California on September 8th, 2017. Shirantha Beddage transcribed “Rub” in 2015 and Marc Hannaford transcribed “Shards and Lemons” in 2015. Roscoe Mitchell orchestrated both of these over the course of the following year. 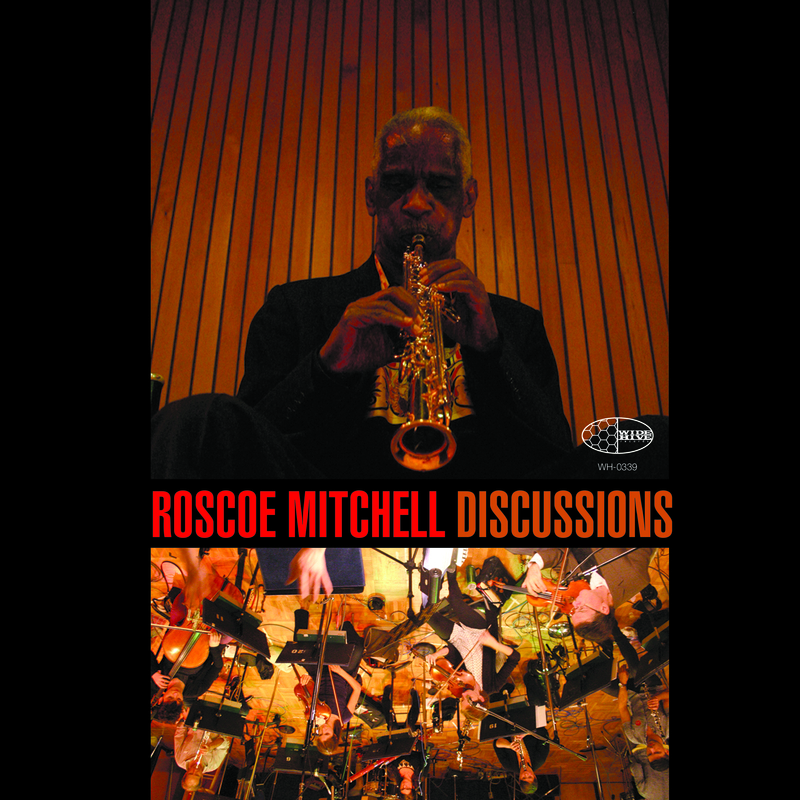 The album “Discussions” is comprised of four pieces from Roscoe Mitchell’s “Conversations for Orchestra” series (conducted by Steed Cowart of Mills College), interspersed with free improvisations. Mitchell and flautist Wilfrido Terrazas transfix listeners with interwoven, aerophonic streams in “Cascade” and “Home Screen” (tracks one and seven, respectively). “Discussions One” (track three) and “Discussions Two” (track five) are group improvisations, devised in the moment by pianist Brett Carson, trombonist Andy Strain, cellist Crystal Pascucci, oboist Jesse Barrett, violinist Mia Bella D’Augelli, bassist Richard Worn, the aforementioned Terrazas on flute, and a percussion section without peer consisting of Jordan Glenn, Scott Siler, and the incomparable William Winant. James Fei joins the orchestra on the album’s closing track, “Who Dat,” contributing his spellbinding electronics to two dedicated improvisation sections within the piece. Conversations around the distinction between musics composed and musics improvised are wont to fall-back on broader questions of authorship, intent, communication, and forethought as conversants struggle to delimit the poles of an ineffable spectrum. Roscoe Mitchell's “Conversations” present an alternative theory of the case, suggestive of Hofstadter's “strange loops,” as the music and its provenance are ever-engulfing and self-enfolding, defying disentanglement with a knowing, Möbius grin. The result speaks to Mitchell's superior talents as a craftsman, shrewd insight as a curator, and poetic apperception as an architect of air in motion.